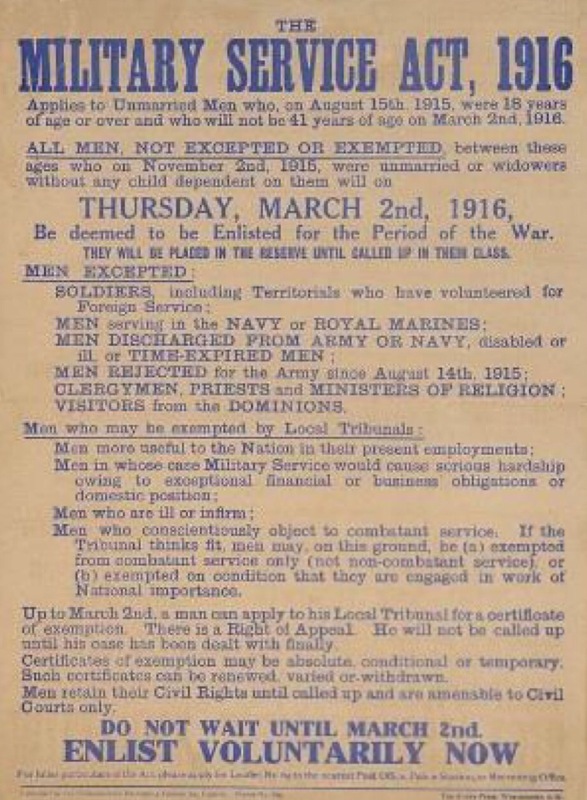 The Military Service Act 1916, which came into force on 2 March 1916, introduced conscription and was possibly the most important piece of legislation placing the country onto a ‘total war’ footing. 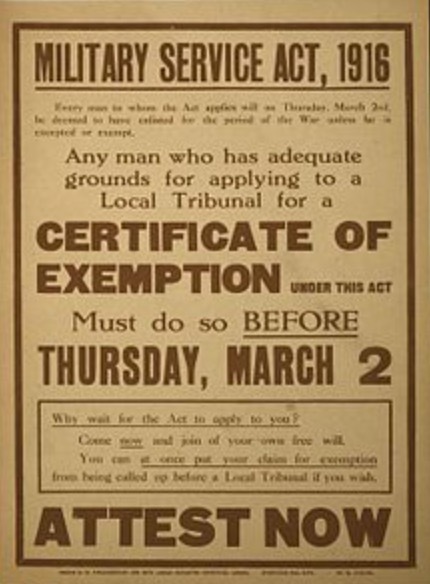 Conscription under the Act meant compulsory military service for every British single male between 18 and 41 years of age unless they were widowed with dependent children. There were exemptions for those in essential war time employment, those deemed medically unfit, ministers of religion, and conscientious objectors. Men or employers who objected to an individual’s call-up could apply to a local Military Service Tribunal which could grant exemption from service, usually conditional or temporary. There was a right of appeal to a County Appeal Tribunal. Within a year of war being declared, it had become clear that it was not possible to continue fighting relying on voluntary recruits. Lord Kitchener’s campaign had encouraged more than one million men to enlist, but that was not sufficient to keep up with mounting casualties. The government believed there was no alternative than conscription to increase numbers. Parliament was divided but, because of the imminent collapse of French Army morale, appreciated action had to be taken quickly. And thus the Military Service Act 1916 was enacted. 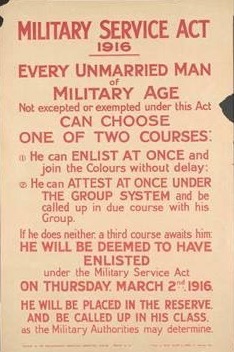 A second Act in May 1916 extended compulsory military service to married men, and in the last months of the war a further Act raised the upper age limit to 51 years of age. Conscientious objectors, who were amongst those exempted, were in most instances given non-combat roles at the front or civilian jobs. Conscription was not a popular move and whilst many men failed to respond to call-up, more than one million did enlist in the first year of conscription. Overall during the war some 2.5 million men enlisted under conscription.